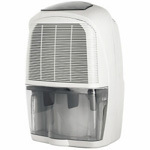 The DeLonghi DEC21 Dehumidifier is a medium to large capacity dehumidifier with an unusual feature. In addition to the standard dehumidifier operation the appliance also includes a heater which not only warms the room but also improves the water extraction rate. It is rated for 18 litres per 24 hours on dehumidifier only setting and 21 litres on "combi" setting, using both heater and dehumidifier. The heater may be run independently and is thermostatically controlled. The heater has two settings, the lower consuming 1250 watts and the higher 2000 watts. With the exception of this rare feature the DeLonghi DEC21 is typical of other dehumidifiers in its class. An adjustable humidistat to control the level of relative humidity (RH)at which the appliance should switch off, to save energy and maintain the RH level at which you are most comfortable. The DeLonghi DEC21 Dehumidifier incorporates a defrost system which enables the machine to operate at temperatures as low as 2°C. This capability allows the dehumidifier it function in a cool place such as garage or unheated house. The DEC21 produces an average noise level for a dehumidifier at up to 44dB. Also included with the DEC21 is the capacity to drain continuously. By running a small plastic hose (provided) to a convenient drain or sump you can be spared the chore of regularly emptying the bucket. The DeLonghi DEC21 is suitable for use in a laundry room as its electrical systems are resistant to water splashes and high humidity. This dehumidifier is not one we could recommend, on the basis of user reviews alone, which were luke-warm at best. The idea of combining a heater with the dehumidifier, while novel, seems an unnecessary complication in a class of appliance with such hard-working moving parts already. A bold experiment but not, it seems, entirely successful.